The future home of & Pizza on Barracks Row remains boarded up after a stop work order, but construction may resume shortly. 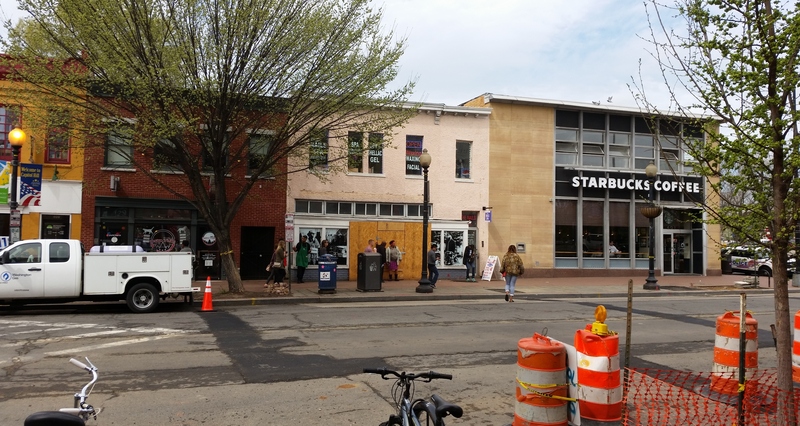 Capitol Hill residents who welcome & Pizza’s opening on Barracks Row – scheduled for last August – have been wondering at the lack of activity since a “Stop Work Order” was posted on the site last summer. The “Stop Work Order” took & Pizza back to the drawing board after neighbors and the ANC took a close look at what & Pizza was up to. Over the next six months, ANC representatives and concerned neighbors met with CEO Michael Lassiter and & Pizza representatives to reach an agreement which satisfied the spirit of the BZA order and which would allow & Pizza to move forward. Calling the modification to the BZA order minor, & Pizza was apparently hoping for a quick administrative review and approval. BZA scheduled a hearing on the matter, and since & Pizza had failed to notify ANC6B in a timely matter, the hearing was scheduled before ANC6B would have an opportunity to weigh in. “I want to express my concern and dismay at the lack of transparency with respect to the pizza case. I strongly object to the BZA taking any action on this case before ANC 6B has had an opportunity to opine on the revisions to the BZA order. The hearing was postponed, and last Thursday night, ANC6B’s Executive Committee placed the case on the agenda for the April meeting scheduled for April 12. Before that, however, the issue will come up for a preliminary review before ANC6B’s Planning and Zoning Committee which meets at 7:00pm, next Tuesday, April 5, at St. Coletta’s of Greater Washington. So. What is actually going on here? Someone at & Pizza authorized proceeding with illegal construction which flouted the BZA order. And while DCRA will issue a stop work order if prompted, the fact is, that once illegal commercial construction is complete, DCRA seldom requires that it be torn out. The usual procedure is for the offender to pay a fine and then conduct business as usual. Former ANC6B Planning and Zoning Chair, Francis Campbell, who was asked to help negotiate a new agreement, said regarding construction without a permit, “This was a mistake. There is no excuse for that.” He gives credit to & Pizza for admitting they were wrong and for working to come into compliance with the intent of the BZA order, even to the extent of agreeing to his suggestion that as a show of good faith they renew their exemption from the Barracks Row fast food ban after five years instead of the seven as stated in the original BZA order. In support of & Pizza’s claim that the modifications are minor, the BZA’s on line case file shows two word-for-word identical letters of support for & Pizza. Both letters – one from Pure Barre and one from Metro Mutts – who are the tenants of the building adjacent to & Pizza on the south side, contain the sentence: “I regard the &Pizza request as extremely minor and I commend them for agreeing to the new terms.” One of Capitol Hill’s major commercial real estate holders – Maurice Kreidler – owns the building housing the two tenants, the & Pizza site, and the adjacent Barracks Row Starbucks. Adding a layer of irony to the story, Jayaraman says he learned in talking to the Office of Planning (OP) that the agency uses the & Pizza case as a training example illustrating how ANCs can use a BZA order to mitigate the impact of restaurants on nearby neighbors. Update: Editor’s Note: The previous version of this post contained some inaccuracies regarding BZA procedures. CHC regrets the error. Too often, DCRA appears to favor the interests of developers and development over those of residents. I plan to boycott this law-breaking, stake-driving enterprise if and when it opens. The “minor” matters are having a cumulatively huge impact on the Hill. Could you describe the nature of the actual changes? While the act of proceeding without permits and making changes is certainly contrary to keeping on good terms with the community, it would be nice to know what the actual variances are. Editor’s Note: & Pizza had decided to use half of the indoor trash storage space which had taken months to negotiate for a cooler, they had put the HVAC unit on top of the trash storage extension instead of the roof, and there was no ventless oven systems meant to reduce odors. The new agreement provides that the indoor trash space will be used exclusively for trash and recycling; that pollution control systems (PCU with scrubbers) will be installed to control odors, that additional an additional HVAC unit will be placed on the roof, and that & Pizza will designate a person on staff to ensure that BZA order conditions are being fulfilled. This is a tremendous victory for implementing best practices in trash management for the city. Kudos to ANC6b for sorting out the restaurateur. Thank you for this reporting and explanation. Your blog is a really great public service. &Pizza’s protracted problems are great news for Pizza Boli. That might be great for Pizza Boli but the quality of that establishment is nothing compared to matchbox just a block away. As a resident I am looking forward to a higher quality pizza place on this block.